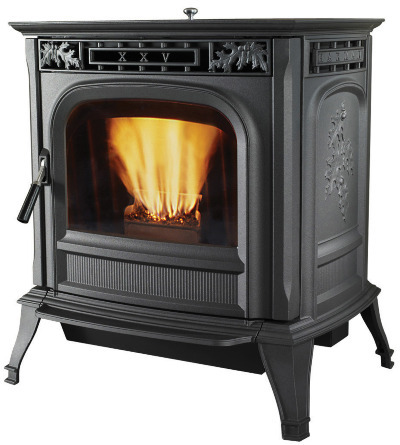 October 2013, see my most recent post about my Harman XXV pellet stove. This is my continuation of initial posting of my Loving my Harman XXV pellet stove , so I guess this may be considered part 2. It has now been almost 2 full heating seasons with using my Harman XXV pellet stove as my primary heating source. As March is underway the stove is still going but I find myself having to turn it down since they days are getting warmer. It seems a good time to write about my Harman XXV pellet with some additional review information. Cost: some people are wondering what the XXV cost and I can say it varies. I have seen them online for a lot less then what I paid in other parts of the country. I can say this, you are buying a solid cast iron stove not some sheet metal no-name brand that looks like it will break after the first year so here is what it cost. The Harman XXV was approximately $3100.00 at the local dealer which included a free ton of pellets. I opted for the optional black metal stove pipe that attaches vertically to the top of the stove, which makes it look like a wood stove and is not necessary at all. Has the XXV paid for itself: The way we look at it, YES YES YES. We are insulated from the oil price spike of heating oil that has happened in Feb 11 and is still rising (hope it goes down) and as an irony pellet prices have dropped so it is cheaper to run. Having to not worry about shocking oil delivery bills has been great. We will have paid $1000.00 for the entire heating season to heat approximately 1900sqft of space to a temp on average of the mid 70’s. We live in Vermont so the outside winter temperature is very cold dropping to below zero F for entire weeks. We could have saved more money by keeping the temp down, but we like a warmer house especially with a little one. Maintenance wise: I had the augur replaced, which was under warranty, due to it making a sort of grinding noise. It took the tech only a few minutes to pull the old one and place a new one in, the hardest part was moving it. I bought the optional pipe kit that makes it look like a woodstove and it was in the way. The warranty is very long on the stove so I thought I would go ahead and have them replace it just in case. Cleaning Tip: Make sure to take the cover off the back and clean out where the pellets come down. It is spelled out in the owners manual how to flip this little cover up after removing this plate which just has a thumbscrew. It is actually really easy once you remove the back cover. I think cleaning it out should be made more important in the manual. I removed a lot of sawdust that had fallen down there, which is normal from pellet dust, and I can imagine it causing issues if it was never cleaned. Tip 2: Get yourself one of those small wire brushes meant to clean a gas grill, they are about 8″ long and have metal bristles that are semi-soft. These are great for cleaning the grooved inside of the stove where the ash accumulates out, and since ash insulates, it can keep your heat output from falling. The tool that comes with the stove for scraping is ok but the brush gets a lot more of the crud off. Hi guys, I live close by in Keene NH. I just bought the same stove XXV. It got installed 3 weeks ago. I used it here there the first 3 weeks but it’s been running 24-7 the last 3 days. I don’t know much about them but so far I love it. I do have one question for you. Do you run yours on Room temp or stove temp. The installer recommended stove but I’d like some other input. My house is old built 1890 & is 1800 square feet. Circulating air in to other rooms should be quite a challenge. Any suggestions would be greatly appreciated. Ours has been going 24/7 for a bit with the weather turning cold too. As for your question, we have been running our stove in stove temp mode. We tried room temp using the sensor but didn’t like it as much. In our house the basement is where the stove it, so stove temp works better for us to keep the rest of the house warm. Also since we don’t use any other heat, having it always putting out a small amount of heat is just fine instead of going off completely. Our house is a split level so the warm air rising actually works well with our hours getting taller on the right right. I do know a couple people who put a fan pointed at a diagnol angle near a doorway. The thought being it would push the cold air from the floor through the hot air in the ceiling and to another room. Might also want to think about floor vent if that makes sense, I hope to put one in myself. My glass tends to get dirty too, when it is on low. It is a l shape starting in the left corner to the right corner then down. Has a slight arc to it and about 2 inches from top of the glass. I let mine cool COMPLETELY then use ceramic glass cleaner, the special stuff made for cleaning ceramic fireplace glass. I clean the glass spotless on the inside. After that it seems to stay clear a long time unless I am running it on super low. I do wipe it down once in a while when still warm with just a small dry cloth, to knock the soot down, that seems to help. I also notice if I let all the ash accumulate, it sents to send more ash into the front door. It sounds like you have a fan issue. I have the stove and fan both set on high. It sure is not quiet but it shouldn’t be “loud”. Having your distribution fan run slower results in not as much warm air coming out the front as less air goes over the heat exchanger.